VATICAN CITY — We are waiting for the pope. He is supposed to come at 11. But then we are told he will arrive at 11:30. The crowd sighs in expectation. People turn to each other and smile, hold hands, murmur in various languages. A few rows ahead of me, a mother juggles a toddler on her lap. A folk-rock band called Miner plays sweetly on stage, their voices a hymn in the cavernous concrete hall. As I gaze up at the stained glass windows, I feel like I am in church, about to be blessed. Which, in a sense, I am. Two hours ago, I walked in the mid-May morning sun through St. Peter’s Square with a handful of patients from Latin America as bells rang out. Soon we will meet Pope Francis. I’m sitting in Aula Paolo VI audience hall in the Vatican. Around me are 1,700 people, 150 of them patients — the largest gathering ever of those affected by a fatal genetic brain disorder called Huntington’s disease. 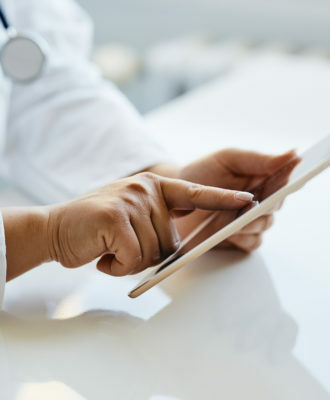 HD causes a staggering array of mental and physical difficulties. There are few treatments and no cure. As if that weren’t cruel enough, many people hide the disease, live in isolation. Afraid of discrimination, rejection, condemnation. Nearly six years ago, my brother died from a wrenching mix of colon cancer and HD. The shock of his diagnosis, his suffering and bravery, and his slow, brutal death nearly broke me. For a time, my family told almost no one the truth. 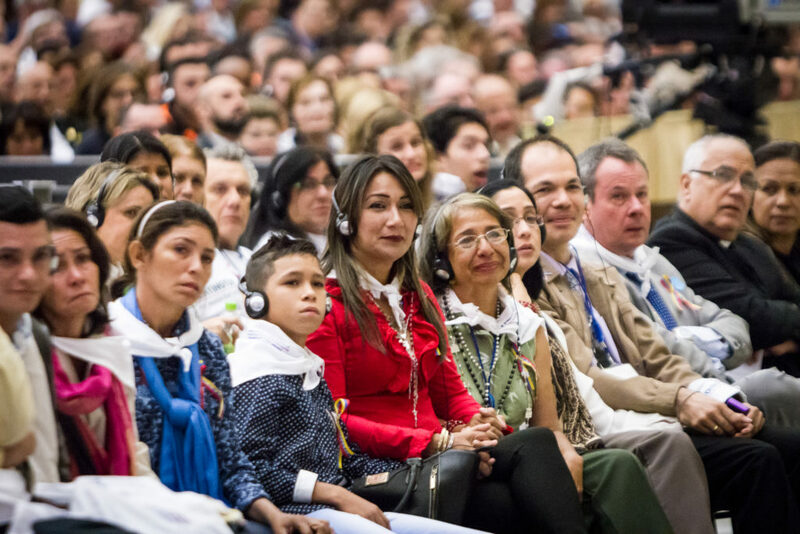 The stigma of HD, and particularly the plight of impoverished HD communities in Latin America, is what has drawn us to the Vatican, for an event called HDdennomore, or Hidden No More. The organizers hope to shatter that stigma, but also enlist the influential Catholic Church to finally render aid to families. It’s the first time a pope or world leader will speak publicly about Huntington’s disease. Because society has shunned people with HD, their presence in the majestic, high-ceilinged hall is strikingly powerful. Scores of patients line the front rows, their symptoms plainly visible. Some flap their arms, jerk their heads. The sickest rock in wheelchairs. No one is ashamed. 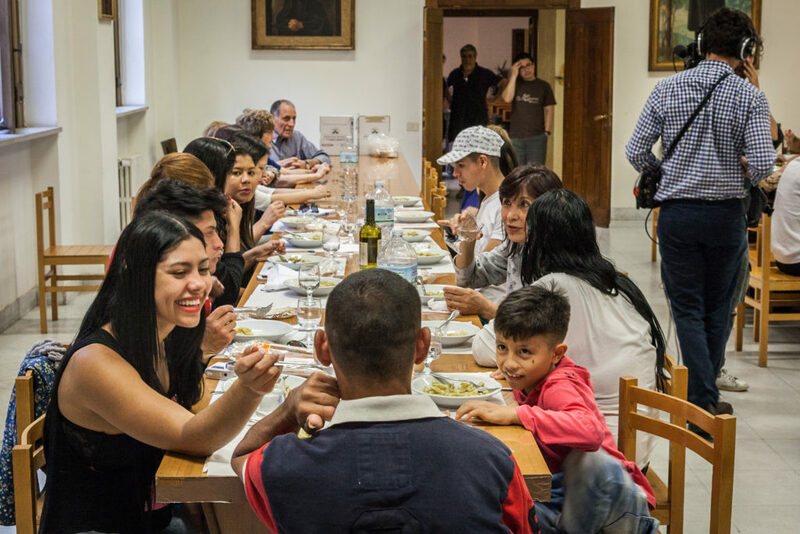 Despite everything, they have traveled from 26 countries — from as far away as Argentina and New Zealand — with an entourage of researchers, doctors, caregivers, and relatives attending them on the long journey to Rome. For some, it is their first trip beyond their hometown. I am not Catholic, although I am Episcopalian, which is similar, I like to say, only with birth control, gay parishioners, and female priests. I’m also not one to toss around religious clichés. But I feel like I’m witnessing a miracle. Before the pope arrives, Charles Sabine works the crowd. One of the event’s organizers, he is 57 and British with waves of blond hair. Sabine’s father, an uncle, and a half brother all died of HD. He carries the gene, too — meaning he will eventually show symptoms of the disease. Before he started advocating for HD, for years he traveled the world as a journalist for NBC. On stage, Sabine asks the audience, who are seated by nationality, to stand up. “Ireland!” he bellows. “Spain!” he shouts. “Vietnam!” As each group rises, the crowd applauds and cheers. It is a profound moment, symbolizing the power of acceptance by hundreds who know their pain. At last they are not alone. In the history of HD research, Latin America figures large. In the Venezuelan towns of San Luis and Barranquitas, Huntington’s is nearly 1,000 times more prevalent than anywhere else in the world. Because of poverty, lack of education, and government neglect, the disease — which is caused by a single mutant gene — flourished and spread from one generation to the next. When scientist Nancy Wexler and a team of international researchers identified the gene in 1993, the DNA of the Venezuelan families was instrumental in that discovery. Yet despite their gift to science, they never benefited. Even today, these communities live in staggering poverty, with almost no food, medicine, or means of work — or even access to the genetic test for HD. Before they left home, she and her two siblings here had never been on a plane and didn’t know where Italy was. Their doctor, a gentle man named Ernesto Solis, took them shopping to a big, air-conditioned mall and bought them shoes, underwear, and other necessities. 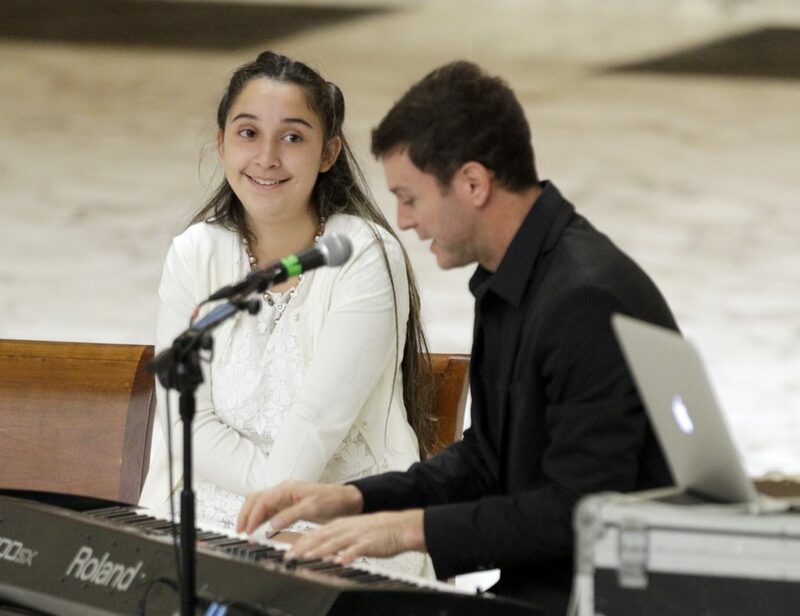 In the video, someone asks Maria Esther: What is she going to say to Francis? “I’m going to tell the pope to help all of us,” she says. As I sit in the hall, moments of drama gracefully unfold. “Brenda, can you come up on stage?” asks Sabine. Smiling, the 15-year-old-girl climbs the steps, her walk shaky. Brenda has come from Buenos Aires, Argentina — the pope’s hometown — with two of her doctors and an aunt who is raising her. They are essentially her only family. She used to share a bedroom with her father until he died of Huntington’s on her 15th birthday. Before that she took care of him. When Brenda started to get sick, her mother fled, taking her only sibling. Now, Sabine wraps his arm around Brenda. Brenda likes a particular Latin American singer who plays the guitar, is that right? he asks. She nods. Isn’t his name Axel? he says. And then just like a teenage girl’s fantasy, the handsome pop star strolls out on stage and embraces Brenda, who looks incredulous. The audience gasps in delight. And then, as we all watch spellbound, the musician sings to her. I instinctively put my hand on my chest and sigh. This unlikely event all began with a one-time foreign correspondent, two scientists named Elena and Nacho, and a California resort. In February 2016, the three found themselves hanging out around a table in the warm desert sun of Palm Springs, where they had gathered for a Huntington’s conference. Dr. Elena Cattaneo had flown over from her native Italy; Muñoz-Sanjuan — who goes by “Nacho”— had come from LA, where he acts as a vice president of the nonprofit CHDI Foundation, and Sabine were there, too. And though the setting was beautiful and serene, they were trying to solve a problem. The humanitarian project Nacho had launched a few years before was struggling. The NGOs he’d approached hadn’t come on board, and funding was thin. On Pierre’s advice, Cattaneo wrote a letter to Pope Francis, requesting the audience. A few months later, she received a letter in return that the Vatican was considering the appeal. “From then on, it was an earthquake,” she said. A rare disease killed her mother. Can this scientist save herself? Ultimately, she received a letter: The event was on. Cattaneo and her friends were astounded. The news was especially remarkable because Francis had never done an equivalent event for any other disease. When Pope Francis eventually appears, he ambles across the stage, gives a little wave. There is polite applause, a feeling of awe. It’s almost as if we can’t believe he’s really here. Seated about a dozen rows back, I lean forward to see his kind, wrinkled face. A huge silver cross dangles down the front of his white robe. His ears are very large. He sinks into a big white chair, two cardinals in black beside him, men in suits with earpieces behind him. Sabine and Cattaneo say a few words, thank the pope for his compassion and wisdom, for “shining a light on our disease at last.” After Brenda and Axel hand him a scroll illuminating the event’s goals, the 8o-year-old pontiff kisses her on the cheek and she throws her arms around him. What a beautiful moment for Brenda, I think, whose young life has been so insufferably hard. Being embraced by perhaps the most revered man on earth. When the pope begins to read his speech, it’s like hearing a prayer. The hall falls silent. 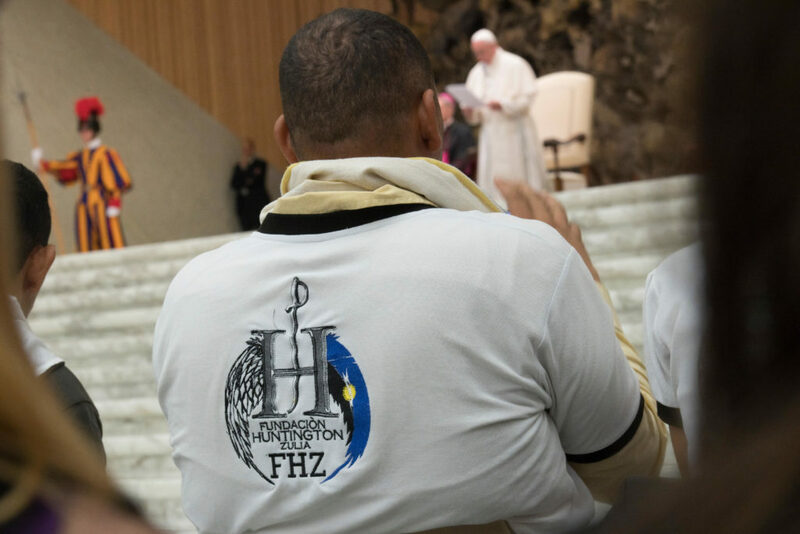 People hope that Francis will speak to the extraordinary difficulties they face because of HD. He does that and more. After the speech and the applause, the pope makes his way down the marble steps, his retinue of handlers following. He is coming down into the crowd. Everyone seems to hold their breath. At first people are tentative. They smile, shake his hand, but seem overwhelmed. Then the pope reaches Maria Esther, and the tiny Venezuelan woman collapses in his arms, crying. Then her 35-year-old brother, Franklin, embraces the pope. And then their 32-year-old sister, Yosbely, completely falls apart. “Please help us, my house is falling down,” she sobs as Francis holds her and Maria Esther. As a mother who faced the possibility of having Huntington’s, I feel my heart break a little. After my brother died, I got tested because I was frightened my kids were at risk. I was negative. All three of the Venezeulan siblings have children and are in the throes of the disease. For the next hour, Francis threads his way through the rows. He looks in people’s eyes. Listens to their stories. Laughs and pats babies’ cheeks. Leans down and blesses patients writhing in wheelchairs. You have never seen so many joyful sick people, families, caregivers, and scientists in one room. 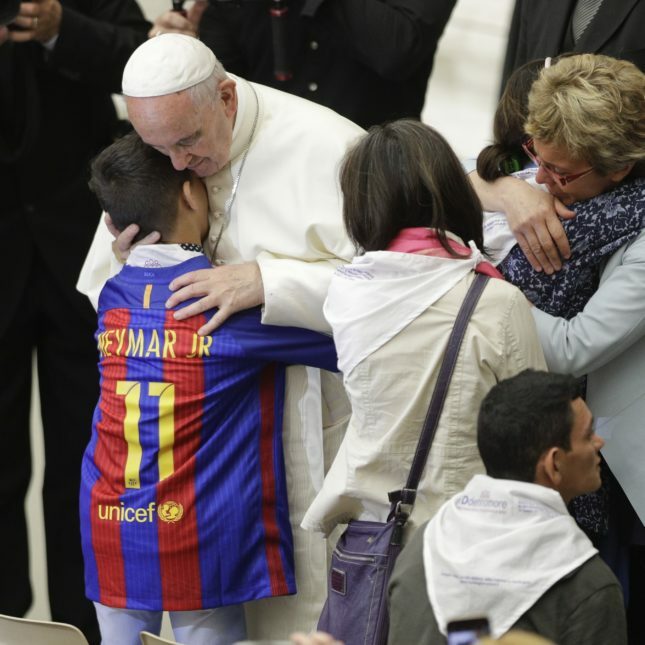 In turn, people deluge the pope with kisses and hugs, photos of loved ones, books and gifts. I laugh when a young female researcher from London asks him for a selfie, which he happily obliges. Suddenly, Pope Francis stands in front of me. He looks tired, though his soft brown eyes shine with light. I’ve been so absorbed watching everyone else that I’m dumbstruck. So I do what seems perfectly natural. I kiss the pope on the cheek. Before I left for Rome, I was afraid I’d get depressed during the event because I knew people there would eventually die, or because I’d be reminded of my brother. But it feels more like a celebration of life, of promise and hope. After the pope waves goodbye, everyone lingers to savor the day. Sabine dances with his young daughter on stage, while Brenda sits nestled against Axel. People who were once strangers talk and hug each other. Researchers who’ve never worked together exchange business cards, email addresses, and offers of help. I don’t normally do this kind of thing, but in the passion of the moment I ask a young Venezuelan actor to take a photo with me. As I gaze around the room, I think of how many people felt so alone before today, and how that has utterly changed. They’re a global community now. That night, I took a cab from my hotel near the Vatican to join everyone for a celebratory dinner. As the sun set over chaotic Rome, we settled into a neighborhood pizzeria where everyone sat around wooden tables, talking, laughing and taking photos. The group was positively rowdy. “Vino! Vino!” someone yelled when the waiter came. I was sitting with Solis, the Venezuelan doctor, and his wife, Reina, Cattaneo, and Franklin, Maria Esther’s brother. “He wants Coca-Cola!” Cattaneo shouted to the waiter, pointing to Franklin. A tall man with gray hair stood near us loudly joking with him. I wondered who he was. “That’s Pierre!” said Cattaneo — her friend with Vatican ties had joined the whole group for dinner. “He looks normal. He’s crazy,” she warned us, and we all laughed. As we dined on pizza, Solis, a soft-spoken, middle-aged man with thinning black hair, told me about the desperate situation in Venezuela. Because of the embargo, they had almost no food or medicine. When, three days before, one of the Venezuelan patients had a breakdown in the streets of Rome, his 13-year-old son cried for his father to be given fruit juice, which is what they treated him with at home. In Maracaibo, where Solis lived, people were starving. He and Reina, who is also a doctor, had lost a lot of weight. Even as they were in Rome, Venezuela was collapsing. Their two young daughters hadn’t gone to school for a few days because of the military crackdown in the streets. He loved his patients, but he didn’t know how much longer he could stay in the country. 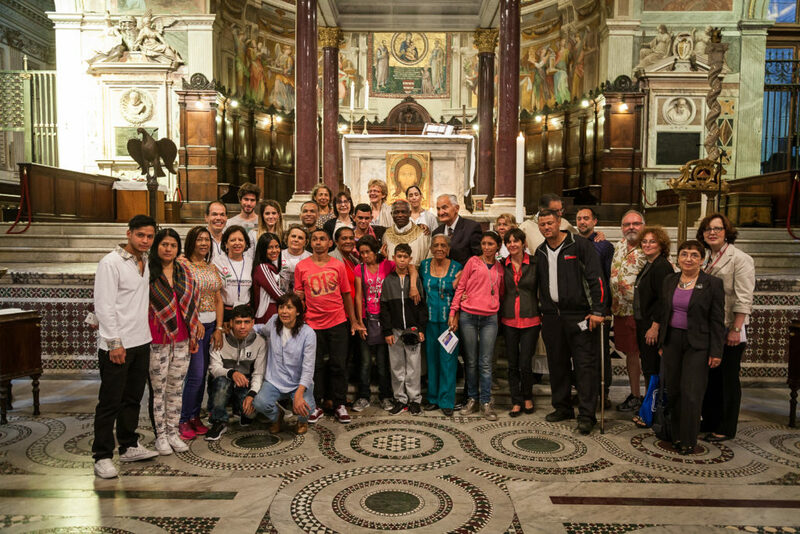 The morning after the papal audience, the families gathered again for a special Mass at one of the oldest churches in the city, the Basilica di Santa Maria in Trastevere. I sat next to Yosbely and Maria Esther. Yosbely, like her sister, was small and thin; her short brown hair was pushed back with a headband. She had a wide smile that revealed her missing front teeth. She was especially sweet and affectionate, always giving hugs. Before he abandoned her and their two kids, her husband used to beat her. Maria Esther’s husband had also vanished. “A lot of times the men leave when things get tough,” Nacho told me. Maria Esther’s balance was terrible, her head wobbled, and she had trouble focusing her eyes. She was also delightfully strong-willed. One pearly evening later that week, we toured the Sistine Chapel. We were about to descend a spiral staircase when I noticed her standing alone. She looked dismayed. The group was leaving and we needed to go, but the woman who often helped her navigate such tricky situations wasn’t around. So, I told her I was going to help her down the stairs, and gently took her arm. She grabbed the banister, her mouth set, and step by step down we went. Several times I was terrified we were going to tumble down the slippery marble steps. We didn’t. Maria Esther reminded me, in a good way, of my brother. My brother was a warm, outgoing guy — and also determined. When his involuntary body movements became severe, he refused to hide or let it stop him from doing the things he loved. He went to football games and restaurants, his daughter’s high-school graduation, flew to LA to stay with me while he attended a conference. The man would have still skied down black diamonds if he could have. At the end he still wanted to brush his teeth without help. My thoughts returned to Mass, when we had reached the part of the service where parishioners and priests offer each other “the sign of peace” — a profound tradition where people turn to their neighbors, grasp their hands, and say, “The peace of the Lord be with you.” It’s to symbolize our role in humanity as peacemakers. As organ music softly played, everyone stood, extending their hands, their voices rising and echoing in the ancient stone church. For several minutes, patients hugged their caregivers, scientists embraced patients, and people left their seats to seek out loved ones. The emotion was overwhelming. 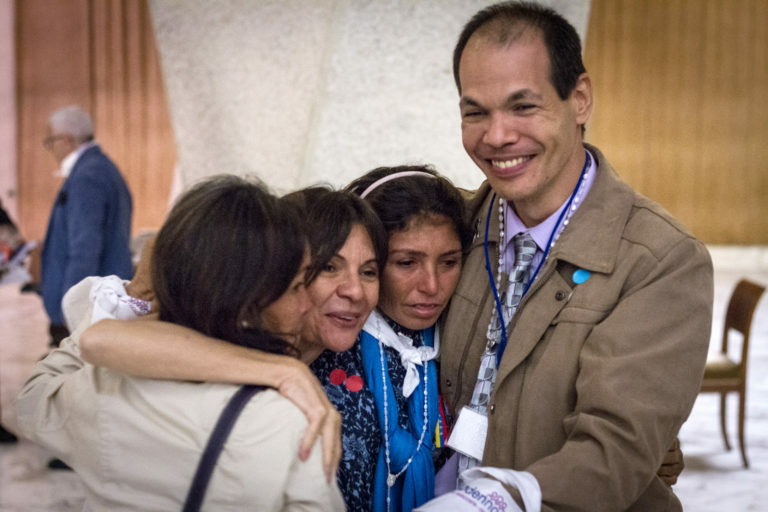 Yosbely, Maria Esther, and the others from Venezuela, where peace was unimaginable, were crying. I had not cried at all during the papal event. But as I stood there hugging a patient advocate from Venezuela, tears began streaming down my cheeks. The morning I said good-bye to the HD families, at the glorious Trevi Fountain, at some point it began to rain. Franklin, his caregiver Samuel, Yosbely, Maria Esther, and I huddled in the doorway of one of the overpriced souvenir shops on the square. Yosbely and I linked arms and chatted. Soon vendors appeared hawking brightly colored rain ponchos and umbrellas. Cattaneo appeared with some small white bags and handed out Italian pastries to everyone. Franklin, who always seemed to quietly take everything in, noted approvingly that I had worn a rain jacket. It was only luck, I laughed. I was going to miss Franklin. Finally, their bus arrived, and everyone began to disperse. I hugged Yosbely, Maria Esther, Franklin, and a few others goodbye and then quickly walked away, reflecting on the moving scenes of the last week. Some stories stay with you, make you feel that life is full of goodness and awe. This would be one of them. As I walked through a cobblestone alley near the Pantheon, the sky over Rome burst into a raging thunderstorm. “I don’t think we’ll ever see something like that in our lifetime,” Nacho had said to me of the papal event. Mona Gable is a writer and the author of "Blood Brother: The Gene That Rocked My Family." What a wonderful story. No matter what afflicts us it is so comforting to know we are not alone. I lost a dear cousin to HD and now am seeing her son progressive symptoms. By it’s very nature it isolates people. This papal visit must have brought so much comfort. I am touched. I will always pray for your spiritual, physical and emotional healing. May God bless all who have means to support you all. Beautifully written and very moving. Thank you for writing about something so deeply personal and that restores faith in the fact that there is good in this world.